Anyone who’s ever seen a non photoshop image knows that everyone has trouble spots on their body. For some of us, it’s back fat or commonly called “bra bulge” and it’s the annoying chub of fat that clings to the back muscles and creates a fold of skin above the waistline or a bulge that peeks out of a bra band. And everyone will tell you that diet and exercise are cornerstones of removing fat. However, spot reducing fat is impossible. Until now. At Noydeen Beauty, you now have the power to kill stubborn pockets of fat using the state of the art laser technology. 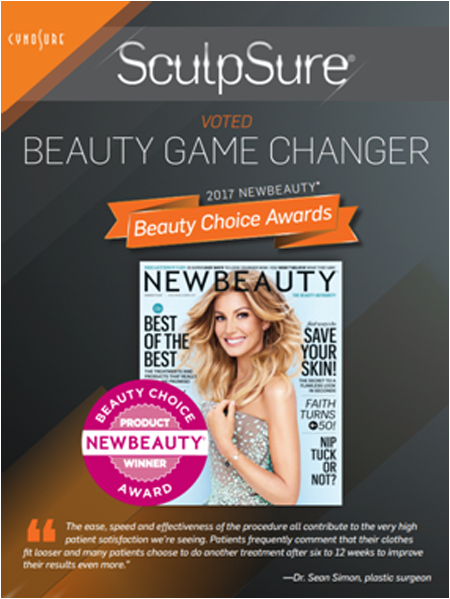 It’s called SculpSure and it’s the hottest ticket to permanently killing pockets of stubborn fat without going under the knife. Noydeen Beauty is on your side against the battle of the bulge. We utilizes SculpSure technology to deftly destroy stubborn pockets of on our back. Using diode laser technology, SculpSure obliterates the fat under the skin. SculpSure works by causing fat cells to die from exposure to the laser energy that creates heat. If your back has moderate layers of excess fat, SculpSure works well to eliminate those fat layers. With one or two rounds of treatment, you’ll about a 24% reduction of fat in the treated area. The laser energy is transmitted through the skin and then absorbed by the fatty tissue which is the main target. In doing so, the energy is absorbed by the visceral, fatty layer by heat which in turn destroys the fat cells. It’s an outstanding laser that can be customized to each body type to deliver great results. At Noydeen Beauty, we works closely with Noydeen Medical side to get great results and deliver patient satisfaction.